The Painting department welcomes painter and former department head Holly Hughes, whose paintings are inspired by historic ceramics, textiles and heraldry. “I want to converse with codes of taste, the shorthand developed to describe nature and the idyllic and pastoral slamming against repossessed abstracted power icons,” she says. 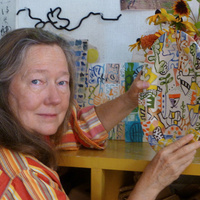 Hughes’ paintings and prints are included in many collections, including Citibank, Davis Museum and Cultural Center, RISD Museum, the Kempter Museum, The Freedman Gallery of Albright College and the Pfizer Collection.